Cathleen Crudden, President of the Canadian Society for Chemistry (CSC) has already hinted at it in her blog post on the occasion of Suzanne Fortier’s exit from NSERC. “Choosing her successor will be a critical task. With academic and industrial researchers calling for more funding of basic research over the last several years, the CSC hopes that the next person to sit in the big chair at NSERC will be a champion for basic research in science and engineering.” And what Fortier’s fellow chemists are saying now is not any different from what other scientists have been saying for the past six years. That NSERC has been experiencing “mission drift” was also a highlight of the recent report of the expert panel commissioned by the government of Canada to review all federal support to R&D. But the need to redress NSERC’s diminished support for basic scientific research during the Fortier era is only a part of the story. Indeed, the button needs to be also reset not only for the drifting mandate of NSERC, which is the subject of today’s blog entry, but also on the management style and modus operandi of its leadership, and on how they need to interact with the nation’s scientific community and with government. These will be addressed in tomorrow’s post. Paul Golby, the newly appointed chair of the Engineering and Physical Sciences Research Council (EPSRC), wrote recently that in order to deal with a surprisingly similar situation afflicting NSERC’s counterpart in the UK, he had “spent his summer visiting universities (in the UK) and meeting researchers to better understand feelings within the community.” I surely hope that the Minister of State (Science and Technology) and the chair of NSERC’s council will follow suit and connect with Canada’s scientific community before proceeding with their search for a new president. Golby “found that the strongest concerns were that EPSRC is putting short-term impact ahead of academic excellence, that it is micromanaging the grant portfolio to achieve this, and not taking sufficient advice from active researchers.” The little he knew that he was also summarizing the feelings of the Canadian scientific community, which is in the process of assessing the last six years of Suzanne Fortier at the helm of NSERC and probably the end of an era. The support of basic research was not a priority of Suzanne Fortier. This statement reflects an overall consensus, not only by the chemists, but also the mathematicians, the physicists, and many others among Canada’s scientists. Mme Fortier talked about “protecting the discovery grants program”, while in reality she was overseeing its demise in so many ways. Just take a look at the slopes in the following graph starting in the year 2005-06, then include the additional $30-50M cut –announced in 2012– from the Discovery Program due to the termination of the Major Resources Support (MRS) and the downsizing of the Research Tools and Instruments (RTI), and decide for yourself on where support for basic research is heading. While the total budget for basic research was admittedly stagnant over the past 6 years, this data should be analyzed in a context where the number of applicants to the Discovery Grants program kept increasing from 3300 in 2010, to 3482 in 2011, to 3900 applicants for the 2012 competition. Furthermore, some of the DG money was siphoned away towards new programs such as Accelerator grants and Frontiers, which even though they still counted as “Discovery,” they were now directed towards specific government and NSERC priorities. But the story doesn’t end here. 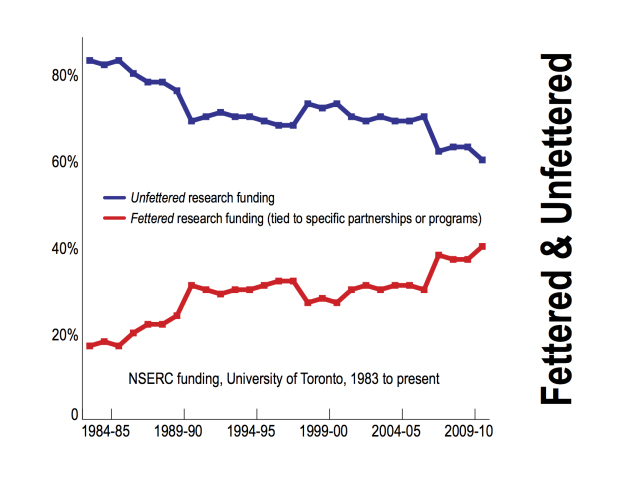 NSERC’s postdoctoral and doctoral scholarships, which were supposed to be as “protected” as the Discovery grants, have been dramatically reduced. In the past 7 years, the number of PDF awards has dropped from 255 in 2006 to 98 (out of 1254 applications) in 2012, and the success rate from 25.4% to 7.8%. Oh! and by the way, “up to 50 percent of the CREATE grants will be dedicated to the industrial stream,” and “at least 60 percent of the CREATE funding will be directed toward NSERC’s priority areas”. Doesn’t this remind you of the EPSRC directives –which ignited the revolt of the UK scientists– such as the one that states that “Applied probability will be “grown” in the UK, and all remaining areas of mathematics are to be “under review”. Or that the agency would reduce funding for synthetic organic chemistry, but will increase funding to the area of catalysis. No other program illustrates the Fortier legacy better than “Engage.” So far, NSERC staff have distributed –without peer review– more than $30-million in Engage grants, which are designed to cover direct project costs for up to 6 months and a total of $25,000 to help set up industry-academic partnerships. These grants fund researchers who can address a “company-specific problem” for an industrial partner, who will own all Intellectual Property (IP) if any, without contributing a penny to the project. That’s right: NSERC now subsidizes companies to effectively hire academics to do their work. Our academics, instead of dedicating themselves to fundamental, peer-reviewed research, can be branch plants for industry. And furthermore, NSERC will pay for it! Make your own conclusions, but make no mistake. Canada’s scientists understand that the government should be –and is– trying to figure out how to increase innovation and industrial R&D in this country. But turning NSERC into an outsourcing service for industry – without peer-review, and with subsidies to boot – is entirely the wrong way to go. And this is where the scientific community took issue with the Suzanne Fortier approach. The “binning system” may be another cornerstone of Fortier’s legacy at NSERC. Under the cover of responding to recommendations from internal and external reviews of its Discovery Grants program, NSERC developed a new evaluation system, which was supposed to be more fair (equal grants for equal merit) and more dynamic (history and track record do not count). But you know there is a serious problem, when the members of NSERC’s Evaluation Groups (EG) are the first to call foul, and announce that they are shocked, surprised and offended by the results of an NSERC’s Discovery Grant competition – the one they just finished running. It turned out that without any consultation, the scientific community was being asked to accept a rigid, unstable, unpredictable, discriminatory system, with minimal uniformity, transparency and accountability and maximal bureaucratic grip. A system that fundamentally changed the mandate of the Discovery Grant program, from one that supports excellence in research to another more focused on training HQP, from one that protects and uphold support for basic discovery to another that favors those who could afford to recruit students and trainees thanks to industrial support for their solution-driven work. We understand that NSERC is now reviewing its “binning system” by consulting the scientific community. Better late than never. Last week, David Naylor, the president of the University of Toronto, made a strong speech about what he describes as educational zombies — government and industry calls for more job-specific education at universities and more research aligned with industry needs. He uncovers how one of these zombies has already had an effect on research funding. 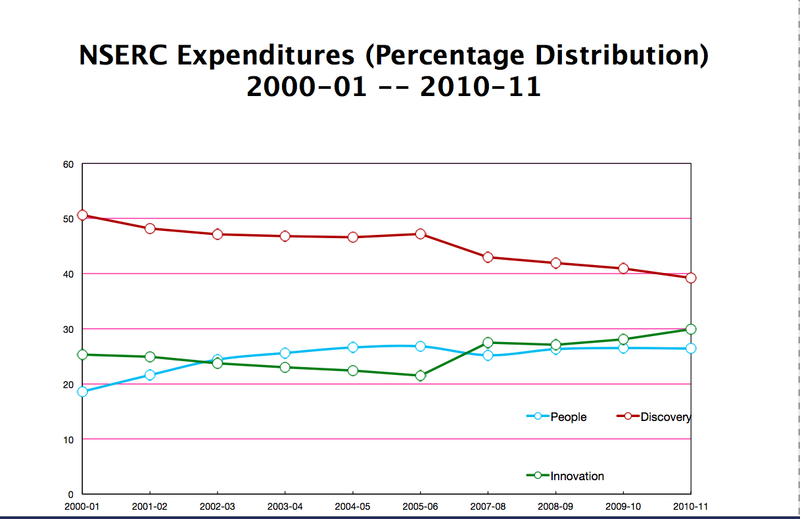 He showed the following data about the funding patterns for NSERC over the last 30 years. Note the last six. It should be interesting to see whether Suzanne Fortier will be fending off university-attacking zombies, now that she is the rector of McGill university, a contender for the top tier of the podium. In the meantime, choosing her successor at NSERC will be a critical task. This entry was posted in Op-eds, R&D Policy and tagged Basic research, CREATE, discovery grants, Engage, McGill, NSERC, postdoctoral fellowships, suzanne fortier. Bookmark the permalink. A powerful piece, which should be read and debated by all the suits who control the future of science in Canada. Well played! Cathy Crudden is a breath of fresh air as the President of the Canadian Society for Chemistry. While all the past presidents have been dedicated and firm supporters of chemistry, and have worked hard to promote science in general as well, I think Cathy may bring something new to the office. She is willing to speak truth to power, bluntly and publicly. She is an ideal person for this task; first, because her scientific achievements are absolutely top-drawer and continue; second, because she radiates enthusiasm and a positive attitude; and third, because she knows what BS looks like and can point it out in the nicest way. Science blogging is a good place to start. Cathy speaks with considerable authority as the President of the CSC, and it is much harder for Ottawa to ignore her than to ignore letters from rank-and-file scientists like me. Piece of Mind has a similar authority, because of the eminent position of its author. But blogging is no more than a start. Perhaps the Canadian science community should consider what the Idle no More movement has been doing?